Never in my history of film watching have I uttered the words "heartfelt" to describe a horror film. But it seems on this date in 2015 I have to use that exact word to describe what a wonderful love letter The Final Girls is. It's a love letter to the stupid, over-the-top horror films from the 80's that I as a genre fan love dearly and clearly so does Todd Strauss-Schulson, M.A. Fortin and Joshua John Miller. Or maybe they are insane, because no sane group of men would attempt to blend horror, comedy and drama together in a way that leaves the coldest of genre fans crying like a baby. Now if only more people in Hollywood could be this crazy. 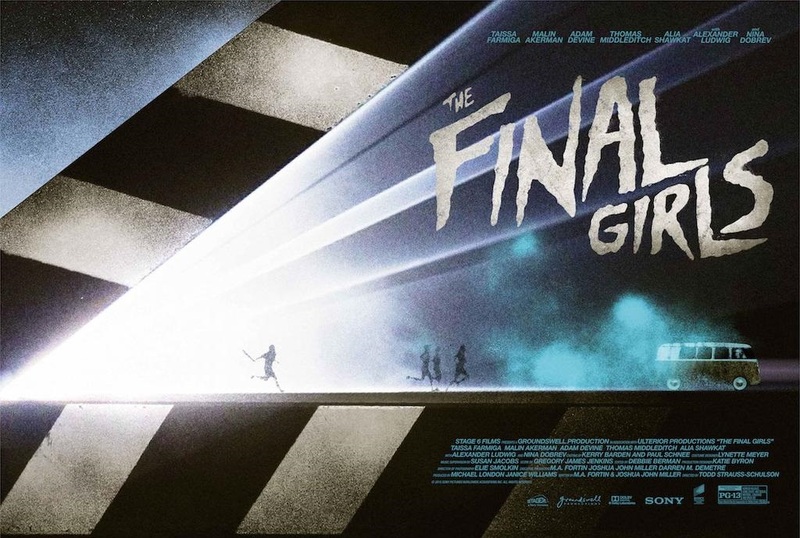 The Final Girls tells the story of Max, the daughter of struggling actress, Amanda, who can't land a role because she has been typecast as a horror girl, thanks to her roles in Camp Blood and other slasher flicks . On one of her many "we'll call you" auditions their involved in an accident and Amanda dies. Cut to three years later and genre fans are holding a Camp Blood screening on the anniversary of her death. Max is forced to attend, but before the first reel change happens a fire breaks out and Max, along with her friends, are transported into the film. That's all you need to know, anymore information would devalue the impact this masterpiece will have on you. The cast is amazing, no, better than amazing, this is literally the perfect cast for this film. Taissa Farmiga delivers the performance of a lifetime. She hits every comedic, emotional and action beat perfectly. She bears the bulk of the movie and brings a new meaning to the term 'seasoned actor'. No other actor could pull off the mother role quite like Malin Akerman did. And as for Alexander Ludwig, Nina Dobrev, Alia Shawkat, Thomas Middleditch, Adam DeVine, Chloe Bridges and Tory N. Thompson, they were exceptional in every sense of the word. One cast member, though, gave a 110% to her role and gave a performance worthy of any 80's slasher film; Angela Trimbur. Angela played the quintessential character in the film within a film and without her the laughs would not land as hard as they did. This film isn't just a horror/comedy, as previously stated, but an emotional drama that deals with loss in one of the most inventive and creative ways ever put to film. The story boils down to a gut-wrenching tale of a girl who is given a second chance with her mother in a way that is, for all intents and purposes, unenjoyable. It's the first horror film where you want the killer to fail and for everyone to ride off into the sunset, make it home safe and just shop online. I loved this movie and suspect that many others will too. It's the "what if" question that every genre fan thinks about at one point or another, but layered with comedic and dramatic elements that will turn any The Notebook book fan into a fan of classic 80's horror cinema. Thank you Todd Strauss-Schulson, M.A. Fortin and Joshua John Miller, and may the sequel gods shine bright on your future.... All three of you truly have Bette Davis Eyes.